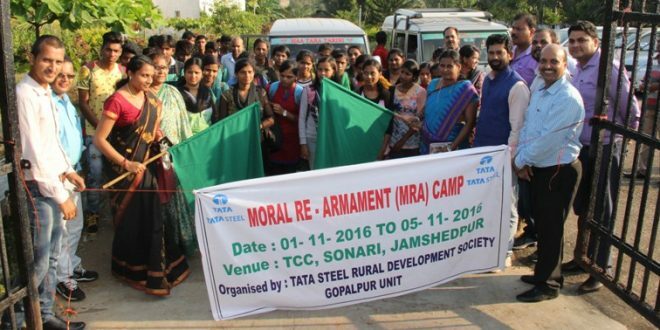 Berhampur: Tata Steel has sent 48 youths from Ganjam district to Jamshedpur for a Moral Re-Armament (MRA) leadership training programme. Kamala Reddy, Chairperson, Rangeilunda Block, and Pratibha Behera, Chairperson, Chhatrapura Block of Ganjam district, flagged off the four-day tour of these youths from the youth hostel at Gopalpur on Tuesday. Present on the occasion were Prashant Kumar Kar, Deputy Chairman, Chhatrapura Block, and Sushanta Kumar Mishra, Chief, Project Gopalpur and Tata Steel Special Economic Zone. The programme will provide orientation training on leadership quality, teamwork and personality development. During their four-day training, the youths will participate in various workshops which will be conducted by experts. The 48 members in the team include 24 women hailing from 15 villages in Chhatrapur and Rangeilunda Block of Ganjam district and studying in local colleges. The team is accompanied by a member of Tata Steel Rural Development Society (TSRDS), Gopalpur Unit, which is co-ordinating the programme. Others present during the send-off function included N. Pradipta Reddy, Zilla Parisad Member, R.K.Singh, Head R & R, Tata Steel, Project Gopalpur & SEZ, Rockey Martin, Unit Head, TSRDS, officers of Tata Steel and TSRDS and members of Panchayati Raj Institutions.